Hello, friends!!! Today, we are here with another important article for you. Here on this page, you will get few tips regarding How to Prepare for Interview. To get a job, candidates have to clear the interview effectively but it is not an easy work. To crack a job interview, applicants have to take care of many things. A losing point can waste your all preparation for the interview. Therefore, here we have given some important preparation tips for your interview. Scroll down your page and read the entire article with full focus. If you want to get a job either a government job or private job, you will have to clear the interview round. Lots of candidates afraid of the interview round because they have the lack of self-confidence and there are so many facts behind this happening. But fearing from any problem is not the solution to that trouble. You need to face the problem and the post-success will be so peaceful. 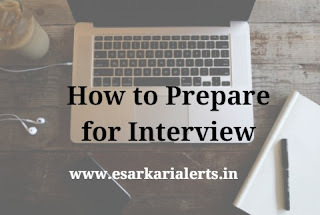 Thus, we tell to those candidates that they can easily crack the job interview if they adopt the below-furnished tips in the preparation for a job interview. The first step that is required to be done by the aspirants is to research the organization in which they have applied for the job. At the time of the interview, the Interviewer may ask you about their organization. So, it is important for you that you should have the basic knowledge of that company or department. For this research, candidates should read few articles about that company on the internet. As well as, they should visit the website of that authority. On that website, check their “about us”, “mission” etc. pages. At the time of the interview, you may be asked about your job profile. So, before the interview, get the proper knowledge of job description. Liabilities and Duties of that vacancy should be known to you. Contestants need to analyze their skills and qualifications according to the skills and qualifications that are required for that job. In the interview, the employer may ask you about your skills. So, be ready to answer this question properly. There are some questions which are certainly asked by the interviewer in the interview. So, search these questions and prepare their responses in a perfect way. In a job interview, you should not wear informal clothes. You should wear the proper formal dress. Moreover, your clothes must be well ironed, neat and clean. Don’t take the wearing lightly because the first impression is the last impression. Applicants should bring all required original documents along with their extra copies. These documents include educational certificate, resume, references, application, and other documents. In the interview, the employer always tells you to ask any question. So, you can easily ask any question without any hesitation. Candidates are suggested to a job-related question. Questions out of job can make your impression down in front of the employer. While facing the interview, you should be positive and self-confident. Don’t look here and there while answering a question. Keep eye contact with the interviewer(s). Don’t be nervous when you don’t know the answer to a question. Thus, these were few tips pertaining to the How to Prepare for Interview. Still, if you have any question concerning this subject then you can get its answer by typing your query in the below given comment section. Are you Unemployed? Get a Job!